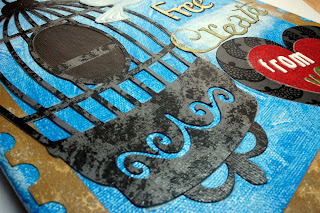 Believe Dream Create with Maria: Bitten By The Bug 2--Blog Hop!! Bitten By The Bug 2--Blog Hop!! 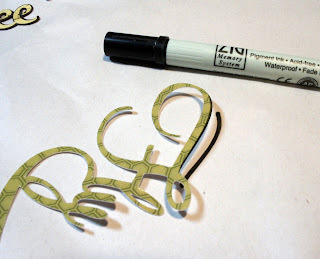 Today is our monthly Blog Hop for Bitten By The Bug 2! 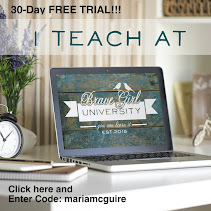 If you have come here from Karen's Blog you are on the right track. If you have just come for a visit, please make sure and go back to Bitten By The Bug 2 and start from the beginning of the HOP to see all the other fabulous creations. Our image today was picked by Sandi (but our Blog Hop is being Hosted by Carole would is helping Sandi out) and I can't tell you how excited I was about this one. The cut is the bird cage/house on the Straight From The Nest Cricut Cartridge or Stretch Your Imagination orany bird cage/house. I had a hard time deciding if I was going to use the asked for bird cage or a different one...I am totally into birds and cages lately. 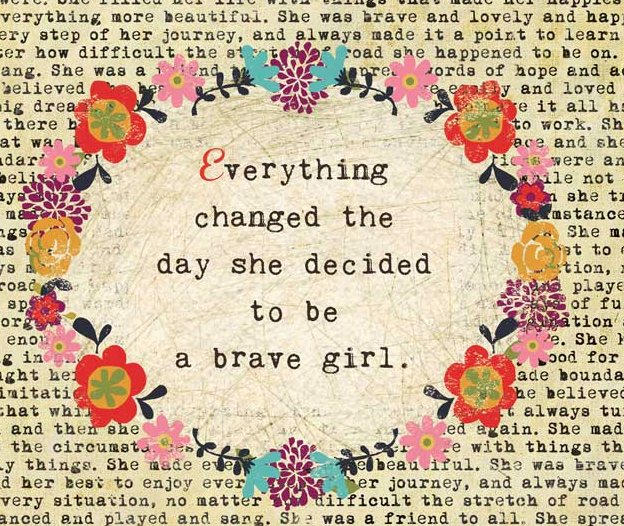 I think it has something to do with my Soul Restoration project I am doing with Brave Girls. In the end I decided to "follow the rules" and go with the cut from Straight From The Nest Cartridge. I also decided to use this project as a little "therapy" for myself. As I have talked about quite a few times recently, I am trying to find a way to bring my two loves together....Cricut and Mixed Media. Here is my attempt. I didn't want to get too crazy with the mixed media because I didn't want to scare anybody away, LOL! I actually thought of this one while I was laying in bed a few weeks ago frustrated that I couldn't fall asleep and frustrated that I could never find the few minutes to myself to work on projects just for me. 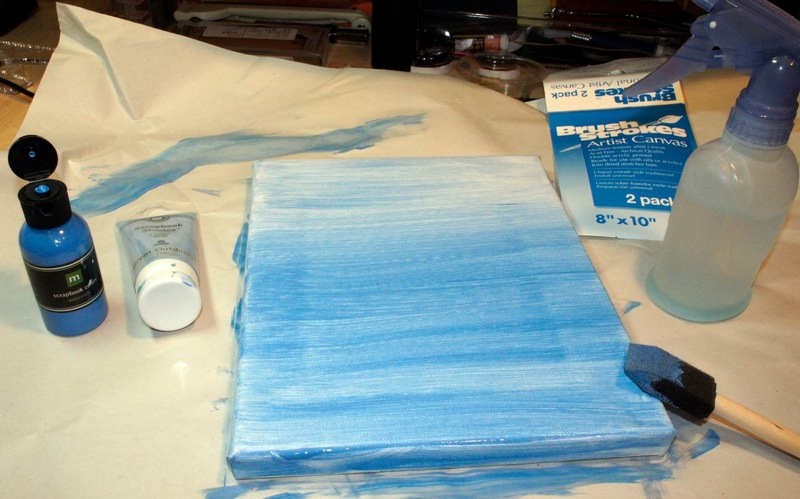 I used a 8" x 10" canvas and blended two colors of blue and sprayed on some water for the background. 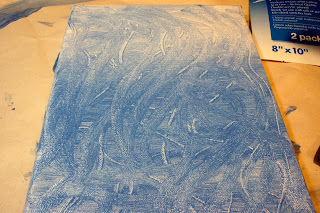 While the paint was still wet, I used my finger to make swirls in the background. All of the images for this canvas were cut on the Cricut. The frame was cut with Kraft paper and the cage with gray. I used paint dabbers to dab paint onto each to give them some texture. Note--the cage may look a little different from the original cut....I stretched it a little with my Gypsy to make it taller for the canvas. For the rest of the cuts, I stuck my hand in a small drawer I have that I keep small pieces of pattern paper leftovers from recent projects. I decided I was going to use whatever I grabbed no matter what the pattern. 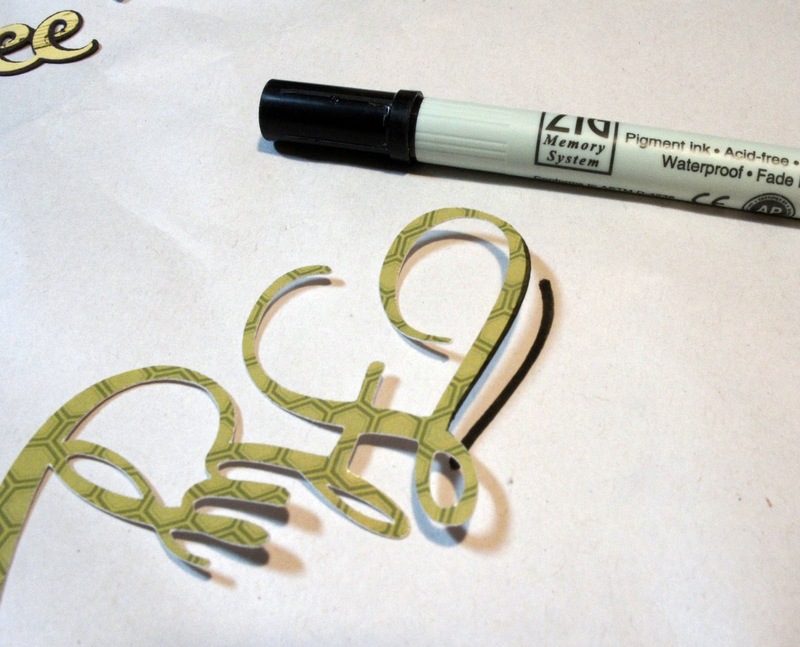 To give a little outline to some of the cuts, I dragged a marker over the edge of the cut. How did I adhere all the cuts to the canvas?? 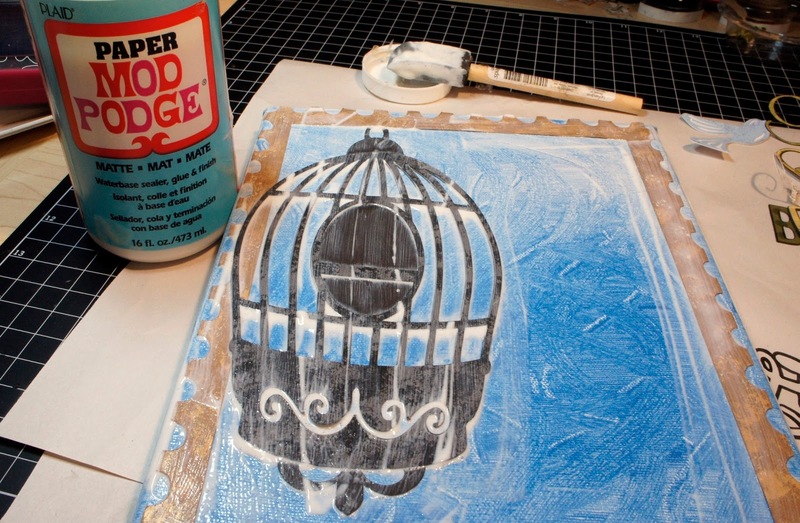 Good old Mod Podge! Matte--don't like the glossy...Been having fun with it in my Soul Restoration projects...sort of brings me back to my childhood. On my heart I added a little Zentangle work for fun and relaxation. Thanks for stopping by today. 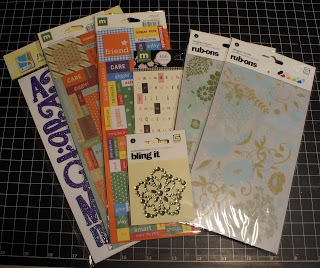 I have a small just for fun give-a-way! 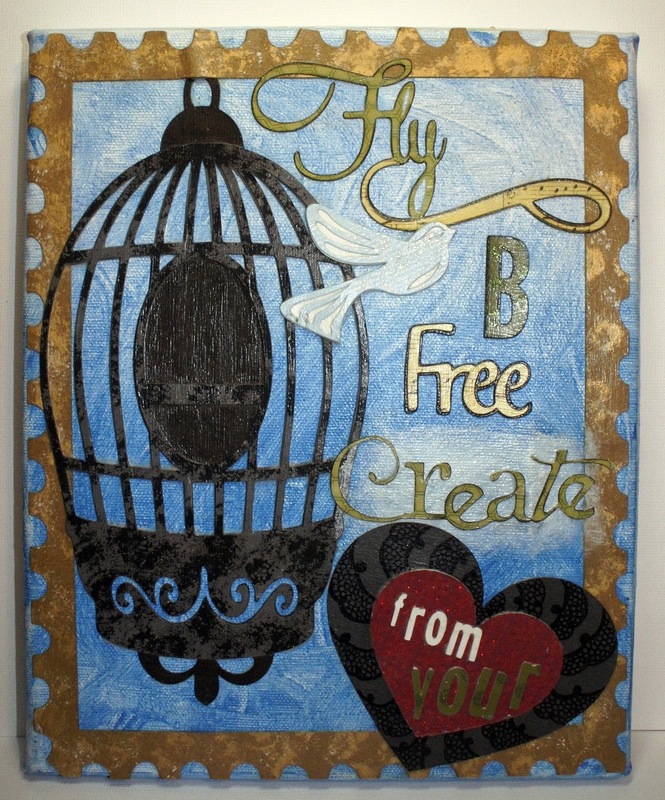 Now head on over to Jeri's Blog to she what creative project she made for you! Your creation on canvas is BEAUTIFUL! Your "words" are really moving & meaningful & just about says it all! Would love to win this really neat giveaway! If by different craft styles, you mean other than "paper" stuff...I also make recycled soda can tab belts. It's RECYCLING!! (Sold a few, but really only to friends & family & gave many as gifts.) I've decided to incorporate my 2 loves by making tags for them w/my "E" & maybe even boxes to put them in. Up until now, I'd only print(using 'puter) on purple paper & cut them out w/decorative trimmer edges. If you find time, maybe you can come over & visit my new blog--STILL learning how to do it!--Maybe I'll post a pic of my belts! Now I'm off to follow the "Bitten2" hop from the beginning. Holy Crap! You are sooo stinkin' creative. The techniques are FAB! What a great project. Love the mixed media and the canvas! Awesome job. What a wonderful process to create this great take on our BBTB2 challenge. Fearless is a great description from Donna....and a fantastic result. love your project i mean how cool is that. thanks so much for sharing!! Love the project. I really need to try a canvas. I struggle to mix my digiscrapping and my stamping/inking. My cricut has been helping. I Love It Maria! I love Mixed Media and I think I know what you mean about scaring some away, I've been wanting to get back to doing more of my painting that I used to do or do more Home Dec Mixed Media or even add more sewing into my projects. I just Love to do soooo many differant things and there just doesn't seem to be enough time to get everything I want to done, lol! And I can also relate to the not being able to sleep, hee hee, it gets so hard to turn our minds off because there's always a deadline or projects to get done, LOL! (I keep a notebook on my end table because I always think of something when I should be sleeping, lol!) 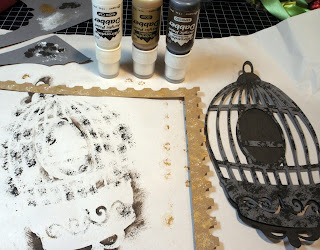 Well I just Love this I may have to incorporate more Mixed Media into my challenges, not just layouts! 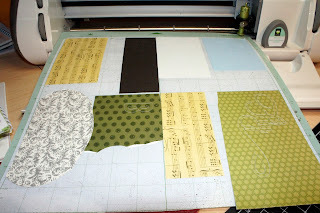 Although you can never have enough layouts, lol! 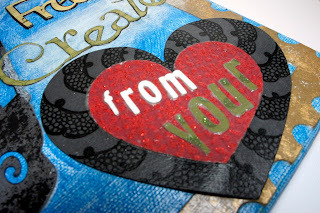 Maria, beautiful card....I love all the detail and work you put into it...GORGEOUS! Wow--aren't you Miss Creative with this project. I just bought a canvas the other day to work on a similar project. It will be awhile before mine is done. There are never enough hours in the day to get it all in. I've been working on 65 shower favors for my daughter-in-laws baby shower and I've got to get that darn Dr. Seuss scrapbook finished before the shower on March 19th. If I could just find the energy to stay awake 24 hours a day I'd be all set. WOW! Talk about fabulous! I've never even thought to use canvas with Cricut. I'm still trying to mix my traditional scrapping with my cricut. It's all new to me. Thanks! fabulous project!!! what a creative mind you have!!! the end results is truely fabulous!! Wow! I love the way you did the background and I just love the peek into your creative process. This is gorgeous!! love your project...not sure what you mean by different craft styles but here is what I think...I have 2 very different styles of scrabooking because I usually scrapbook for my nieces's very cutesie girly pages and for my personal taste I do mostly dark colors for my pages. Thanks for the giveaway!